Motivation can be defined as the willingness or reason for behaving or acting in a certain way. You often hear the word motivation used in everyday language – such as, you need to be more motivated in your studies. In this regard, motivation means some form of driving force that compels you into action. Without motivation (willingness to act), then things are not normally done as required inside an organization. 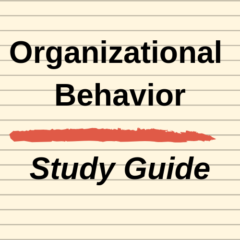 An organization would have a goal to motivate its employees to perform particular tasks to particular standards. A good example here would be customer service staff – where an organization like to see its customer contact staff always providing a high level of customer service. As you can probably guess, the constant delivery of a high level of service is often draining to the individual – so an underlying driver of motivation is usually required. This motivation can come from the individual – that is, self-motivation. But in most cases it needs to be driven by the organisation itself. Are the employees rewarded and recognized for certain behaviours and performance? Is the organisation providing an employee with a motivation to act and perform his/her job responsibilities in a certain manner? Textbooks on organisational behaviour generally discuss three elements of motivation, namely intensity, persistency and direction. Intensity is the strength of the motivation and the impact it has on the employee’s efforts to complete their task according to certain standards and benchmarks. Persistency refers to the ongoing nature of the motivation and whether the employee is willing to continually act in a certain way over time. For example, an employee might be motivated to perform well when there is a supervisor around, but quickly loses this motivation when they think that not being watched. And finally direction refers to the actions to which the employee’s motivation is being directed. Again using the customer service example, one employee might see customer service as being friendly and nice (and focus their efforts there), while another employee might see customer service as being sales oriented.